Here are the snack and on-board food service offerings from several of the more popular airlines, along with Diet Detective’s comments, ratings (Health Score: 5 stars = highest rating, 1 star = lowest), #calories, exercise equivalents (amount of walking required to burn off the food consumed), and personal choices. Health Score: (**** 1/2) Continental provides a variety of options and offers free, low-calorie, high-impact #meals/snacks to hungry passengers. Best Bet: For flights of two to three hours, both the Petite Cold Sandwiches are good options, and Continental even offers light mayo. For breakfast, skip the calorie-laden muffin and have cereal with low-fat milk and a banana. On flights of more than three hours you get one of the hot sandwiches listed below, a salad (and a Lite Ranch dressing is offered), as well as a fun-size candy bar. Pretzels, 45 calories, 12 minutes of walking (flights under two hours). Fun-size candy bar (see below for info). On flights of more than three hours: sandwiches, a salad, and a fun-size candy bar. Best Bet: Your best bet is the Cheese & Cracker Snack Tray. Just skip the cracker packages. The Premium Nut Blend is a strong nutrition choice, but make sure to split it with at least two other people. If you’re traveling alone and don’t have a lot of willpower, take a third of the nuts and give the rest back to the flight attendant. Nuts are very high in calories, but the remaining choices don’t offer much in terms of nutrition, and they’re just too high in calories. If you’re on a longer flight, the Boston Market Chicken Caesar Salad with SunChips and dressing is a pretty good meal choice. Also, it’s nice that the dressing is on the side (use it sparingly). If you’re flying for three hours or more during breakfast, your only choice (other than the snacks) is the Breakfast Café, which is not too bad. Cooperation in Providing Nutritional Information: Helpful. United was not as helpful as in past years. Health Score: (*** 1/2) United still has the best variety, but their healthful offerings have been reduced. United, have you looked at the calories in those snacks? Yes, there are two energy bars, but still…what happened to your healthy mission? 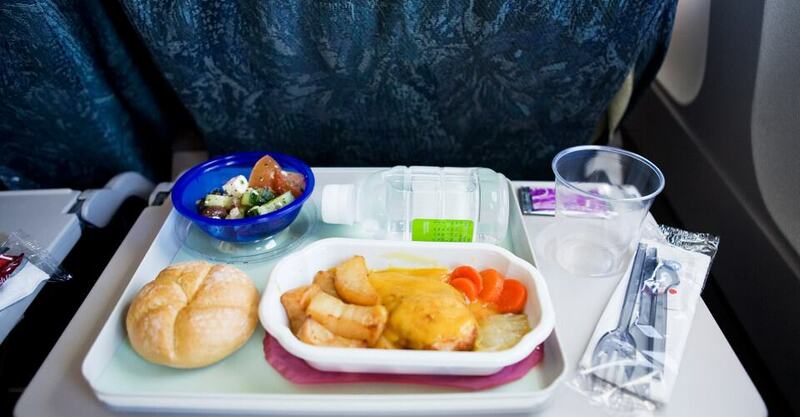 If you’re traveling more than five hours, they offer snack boxes, fresh salads and sandwiches, but the sandwiches and salads are much less health-oriented than the snack boxes. Best Bet: For flights longer than two hours go for the Active snack box. Even though it has more calories than the Organic, the Active has better food choices, and if you want to save calories eat only half the chips. For flights longer than three hours, United has a plethora of choices but not very many that are healthy. For breakfast, your best bet is the low-fat yogurt and fruit. Or you can have the ham and Swiss croissant. At least you’ll be getting a good supply of protein, and it’s not high in calories. For lunch and dinner, you’d think the turkey sandwich would be a good choice, but it’s the highest in calories. The roast beef sandwich isn’t bad in terms of calories, and the salads are both fair choices for a full meal. They’re served with dressing on the side, so try to use only half. As far as the individual snacks are concerned, wow, those are some pretty high-calorie items! Stick to the energy bars: At least they’re portion controlled. Clearly these snacks are meant to share, but typically we eat whatever we’re given, especially on a long flight. Health Score: (*** 1/2) The individually packaged snacks are portion-controlled; however, you can ask for as many as you want, and many people do. JetBlue is improving slowly. All their snacks are under 140 calories, which isn’t bad. I like the fact that they’ve lowered the overall calorie count of their snacks and added a Stella D’Oro Breakfast Treat for 100 calories as well as the Fiber Gourmet Cheese Snacks, which are only 50 calories. But JetBlue could be more creative and come up with a few healthier, more innovative snacks. How about a Larabar energy bar? Just a suggestion. Best Bet: If you’re really hungry, try the nuts: They have protein and good fat and will satisfy you. Eat them one at a time. The animal crackers are OK but not very nutritious. Try to stick with no more than one snack. Just because they offer more doesn’t mean you have to take them, especially if you’re not hungry. Cooperation in Providing Nutritional Information: Somewhat helpful. Delta was cooperative in getting us the snack information but left out all of the important meal information. They claim the information is not available. Huh? Sounds like they just don’t want to give consumers vital nutritional information. Health Score: (*** 1/2) Delta’s individual snack choices are not very good, but their meal choices on longer flights are reasonably healthy. They can do much better. Best Bet: If you’re traveling 1 1/2 hours or more you can have one of two snack boxes, chips and M&Ms or trail mix. Your best bet is the Flight Delight snack box. For breakfast options (on flights of 3 ½ hours or more) Delta offers a fruit and cheese plate. The cheese is very high in calories, but it’s still a nice option if you skip the crackers — at least you’re getting some nutritional benefit from what you’re eating. Skip the egg salad wrap at all costs: Between the “layered” cream cheese and the egg salad, you might gain weight right in the middle of your flight. Ditto the blueberry muffin. For lunch/dinner options, Delta again offers a fruit plate, which is not a bad option. The Asian shrimp salad is also a good choice, especially since the dressing is on the side so you can use it sparingly. Another pretty good option would be the roast chicken sandwich with cheese and dressing, but the honey-mustard dressing can be high in calories, so don’t use too much. Cooperation in Providing Nutritional Information: Somewhat helpful. They neglected to send information about their non-snack items. Health Score: (** ½) There are some decent choices in the snack box, but overall the choices could use a health tune-up. On flights under 2 1/2 hours they offer only pretzels. Not much nutrition there, but at least they’re not too high in calories. Best Bet: The fruit and nut mix is very high in calories, so don’t eat more than one or two small handfuls and give the rest away. The chicken salad snack box is not a great choice, but if you must have it, skip the cookies. The salami and cheese box is not much better. These snack boxes are terrible compared with United Airlines’ boxes. Take note US Air, or better yet, contact the previous provider of United’s snack boxes, Go Picnic. Aside from the boxes, there are a few solid offerings in terms of snacks. Your best bets are probably the Quaker Oatmeal Express or the almonds, if you have someone to share them with or enough willpower to save some for another day. Almonds are healthy, but each one has 7 calories. For breakfast the choices are not so great. There’s a fruit and cheese platter or a turkey deli club. Although it’s not really a breakfast choice, you can pick the turkey off the sandwich to make a healthy snack. The sandwich comes with a side of mayo (skip it for sure) and a cup of strawberry yogurt (too bad it’s not low fat). The cheese and fruit plate is not too bad, either, as long as you toss the crackers. For lunch and dinner, go with the Caesar salad, but skip the dressing and use that lemon wedge they give you instead. It’s the dressing and to some extent the cheese that cause the calorie overload. Skip the pastrami sandwich. Not only is it very high in calories on its own, but it’s topped off with Thousand Island dressing and a cookie…please. Cooperation in Providing Nutritional Information: Very helpful, really very nice people. Honey or dry-roasted peanuts or pretzels (70, 70, 50 calories; 18, 18, 13 minutes of walking). Looking for tips to make your travels healthier? Check out the Diet Detective’s Last-Minute Vacation Diet Cheat Sheet.